Really fancied this dish tonight, last time i did this i used chicken tikka but i didnt have time this week to marinade the chicken so i used regular pre-cooked chicken. I also sliced the garlic instead of chopping it finely - i definitely preferred biting into the thin slices of garlic, absolutely delicious! 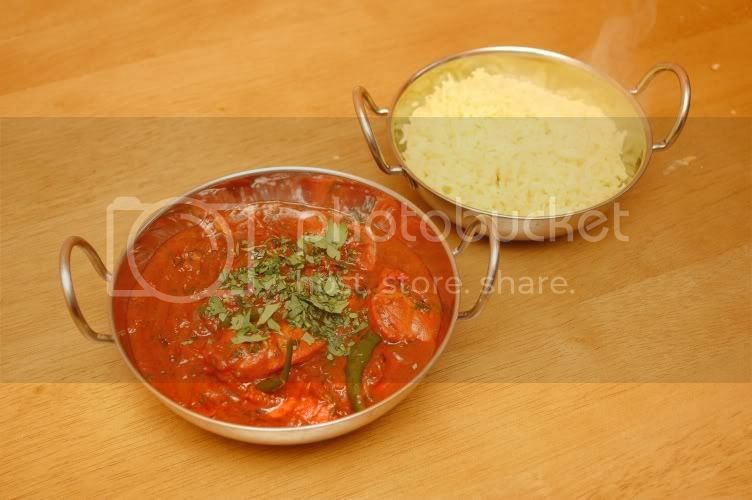 I posted on Real Curry Recipes so can you! Looks very tasty,and hot, might give that one a try. Gateshead; A road to and from Newcastle and that's it. Braw dish 5th. Garlic is very close to my heart, I love the gorgeous stuff. You bring up a very valid point. I always studiously, finely chopped my garlic, BIG mistake. Nowadays, I tend to cut a clove in half, then coarse cut it. This means it takes a fair bit longer to brown, it also means you are going to get much closer to having your garlic cooked properly. Finely chopped garlic really isn't the way to go, it'll brown/burn in a second. I'd prefer to slice it (i sliced it lengthways this time) rather than cut it into rough chunks as it'll cook evenly if it's all the same size - that and i reckon it's more visually appealing too. 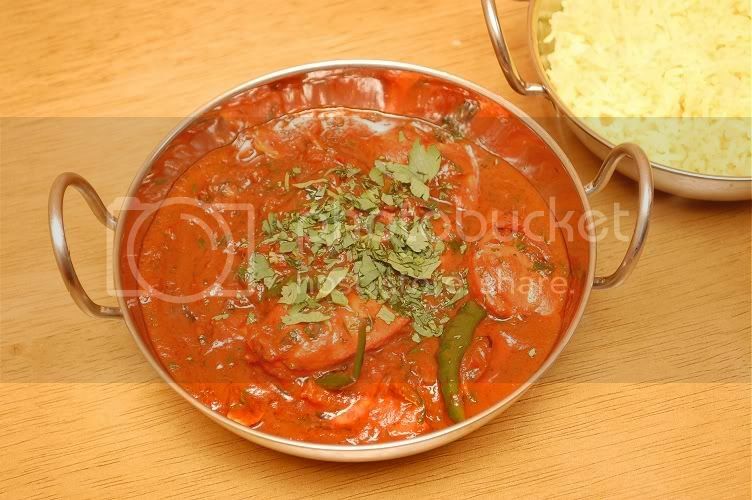 Looking at these photos this morning has got my mouth watering, this is defininitely one of my favourite curries and i reckon it should really be added to the MB3 section! For anyone wondering, i used a touch of red food colouring powder to achieve the deep red colour - last time i had this from the takeaway it wasn't red, but personally i just think it looks better red. Is this the recipe you used 5th? cant take the credit for this one. It was a recipe that Tim (Ferret) posted a couple of months back. I made a few alterations to suit my taste. Here is Tim's original recipe. 1. Heat 4 tbsp veg oil with 1/2 tsp aromatic salt on a very high heat. 4. Back on a high heat, then add a ladle of grabbi. Fuse and flame. More grabbi, then pre-cooked chicken in. 5. Low heat. 1 chef's spoon chopped coriander. Cook off, adding more grabbi as required. Serve garnished with chopped coriander leaf. The changes i made were that i used 4 birdseye chillis finely chopped in stead of the 15 cut in half. 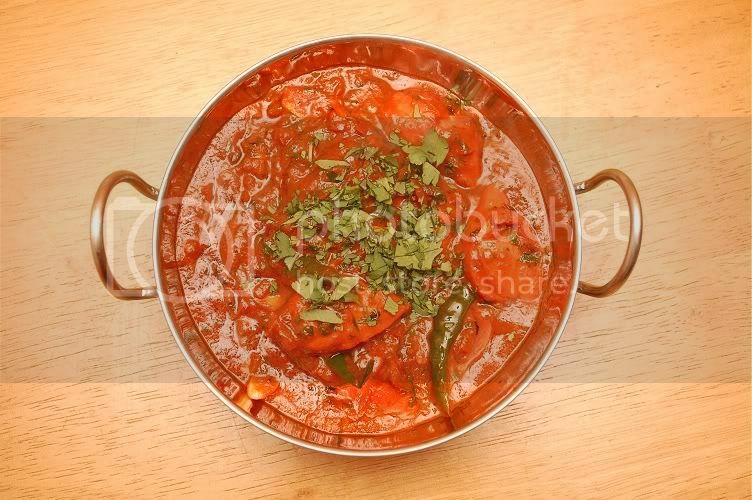 And to up the heat i used half a tablespoon of chilli powder in stead of 1 teaspoon. I used the mb3 base, not sure whether Tim uses the savoury base for this one. Anyway the results were superb. You wont be disappointed. Let me know how you get on. Also many thanks to Tim (Ferret) for posting the original. Yeah that's the one...great recipe. I didn't add the lemon juice though as i had none to use. I also reduced the chilli powder to 1/2 tsp and only used 5 green chillies, it was still hot enough for me - i'm not a huge fan of really hot currys hence why i toned it down. As for the garlic, i used 4 fat cloves thinly sliced lengthways. Looks absolutely brilliant what you cooked. Do you also use the "special" mix powder?